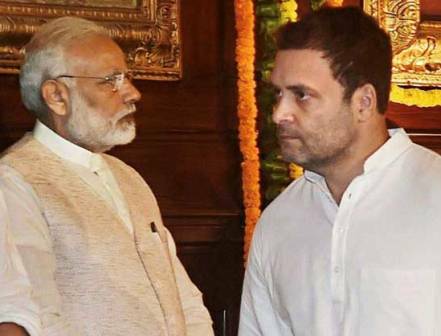 ONI Bureau: Many of us repeatedly heard the slogan, ‘Congress-mukt Bharat’ given by PM Narendra Modi, BJP President Amit Shah and other BJP leaders. And, they worked on that plan using all their strategies. But, as Congress bounced back in some states, the interpretation was changed to ‘Congress-culture Mukt Bharat’. Our Debate Question: Will ‘Congress-mukt Bharat’ slogan become a reality? Dharmveer Singh: No way. It’s not possible. Sai Papu: Yes. If Narendra Modi continues with his good jobs and not relying on some of his corrupt ministers. Nirmal Panda: Not Congress mukt, gradually it seems Congress jukt. Akhand: Any call to remove a political party from the nation, is not a healthy sign for democracy. It leads to monopoly and dictatorship. While change in government is needed in the interest of the nation, a strong opposition is very much needed. Basudev Bhatt: It will be Congress-yukta Bharat eventually. Chakradhar Sarangi: Yes, if Rahul Gandhi continues as president, it might happen. There are true leaders in Congress party, but they are compressed by the Pidis. We, the public want a strong opposition. Barendra Kumar: Slowly, it’s going to be BJP mukt Bharat again. BJP usually gets a chance of five years….after a Congress-led government for 10 years. Congress dared to relieve all the non productive seniors to make Rahul Gandhi the President. The difference was not huge in 2014. While BJP had received 17 crore votes, Congress too got support of 10 crore people. Modi still remains a hero, it seems. But, time will reveal all his bluffs and the process has already begun. Padmanav Behera: It’s not at all possible to make India Congress-mukt. The party will play a key role in 2019. Too much arrogance and ego will sink the ruling party (BJP). Yudhistir Pradhan: India will be free of Congress. The process started in 2014, and it is moving at a faster pace and may take the speed of a bullet train soon. Suchintan Rout: Yes. It’s possible. Akshay Rout: No. The Congress can revive from ashes. Performance of Modi is very very poo. It’s not in real terms. Kumar Sridhar: Rahul Gandhi who deserves to be the next PM must organise Congress from grass roots level and strengthen the party. The recent Gujarat polls and some bypoll results indicate BJP would face the heat. Instead of ‘Congress-mukt Bharat’, it won’t be a surprise if we hear ‘BJP bhagao, Desh bachao’. Those who seek to write Rahul Gandhi off in public, are actually scared of his rise. Prasant Rai: Yes, certainly because of negative politics by Rahul Gandhi. Bhabani Shankar Hota: Congress Mukta Bharat was achieved in the bye-election to Rajasthan a few days ago. Tusarkanta Satapathy: Modi Ji has already taken u-turn on this and clarified it’s not Congress-mukt, it’s just Congress culture mukt. Gyan Ranjan: It’s now difficult to think about a Congress Mukta Bharat keeping the present trend in mind. A strong opposition is sign of healthy democracy. PM Modi may continue to win heart, but their CMs may fail to counter anti-incumbency. Devi Prasad Misra: The slogan itself is not proper. Every political party can function in a democracy. As a matter of fact, democracy should become stronger; there has to be a strong opposition. Bharat Mishra: The Sooner, The Better. Divyaranjan Roypatro: It’s impossible as log as Jaychandras are there in India. Suvendu Mohapatra: Yes!! The process has already begun. If you check, Congress is left with only 4 states and 47 out of 545 MP seats. Congress ruled India for 55 years and they resorted to hate politics only. Massive scams and corruptions took place. In the name of appeasement, they ignored the majorities and used minorities for self gain. After many years, India got a full majority and installed a non corrupt govt, whose captain is dynamic, dashing, workaholic, visionary, magnetic, patriotic leader with massive fan following could uproot Congress. Prasant Kumar Satpathy: No way…. It’s just impossible. Vivekananda Dash: Such slogan itself is out and out anti democratic & it smacks of arrogance & dictatorial mentality. Jagannath Satapathy: As per my perception, the grand old party has the internal power for raising from the ashes thanks to their all-time loyal core Voter segment across India to the family. So, it’s not possible to achieve Congress-mukt so easily. However, Modi ji got enough support from the public agony, which might be temporary, as lower middle class and tax payers are unhappy with the last budget. Again the election of Chhattisgarh, Madhya Pradesh and Rajasthan will decide which direction the wind would blow. But, it’s true that Modiji has lost a big opportunity to reinvent himself and make a big impact. He may have to pay a heavy price. So, Congress-mukt Bharat still remains a day dream. Ranjan Kumar: Let there be any Govt; the most important is Corruption Free Governance. Congress=Corruption.